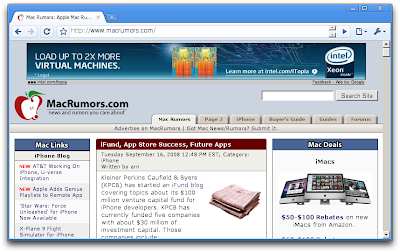 A New Mac Tip Every Day: Google Chrome on a Mac! Google Chrome on a Mac! If you want to check if your websites are compatible with Google Chrome and you only have a Mac, there is an alternative (doesn't require Parallels or VMWare). CodeWeavers has successfully made Chrome run in virtualization but without the need of any virtualization application. They have used the code Google distributes as open source and repackaged it as CrossOver Chromium. It doesn't run that well, because it is not running natively, but it is still useful for checking if websites are compatible or just for checking out what Chrome is all about. It takes like five minutes to load the first time, but once the install is done, it loads usually pretty fast. One thing that I have noticed is that Flash doesn't work in it right now. You can check it out here on MacUpdate. I think I rather wait for the Mac version, im pretty happy with Safari and Camino for now. I thought the rendering engine is the same (webkit) as Safari, so a webpage will look the same? If Chrome does not follow the W3C standards then I don't care about it. If a site does not comply with W3C standards I do not care about it. The essence of the web was and is the set of standards (XHTML, CSS, ...). It is this interface that makes the web work. So, if Chrome does stick to the standards it will render W3C compliant sites fine. All the rest is junk.